Some local parishes, like Kirkby and Broughton, honoured those who served, (or at least some of them) as well as the Fallen. (See photo, right. CLICK on it for enlarged view). We have come to feel it would be good to remember all those from Stokesley who served and survived, as well as the 54 men recorded as Fallen already commemorated in the Stokesley Parish Book of Remembrance. Thanks to the availability of military records, we originally found a further 120 names with Stokesley connections. Subsequently the Northallerton Archive has provided us with a list of Stokesley and District voters who were absent on war service in 1918. Essentially, this is a list of men (and at least one woman!) who would be entitled to vote in the next elections but who were away serving their country when the electoral roll was drawn up. This provided us with over 170 names, though some of these are men who were to fall in 1918, some of whom are recorded in the Book of Remembrance. 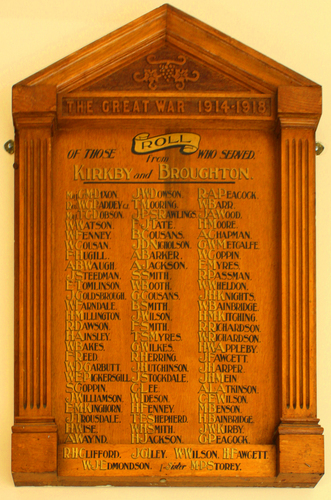 In March 2014 we also came across a manuscript Roll of Honour which contains more than 290 names compiled by Charles Hall (who co-ordinated the creation of Stokesley's Book of Remembrance). This as compiled in the 1920's as part of Charles and Marian Hall's project to write a history of Stokesley. It was made available to us by Alan Swales of Broughton (a Stokesley man by birth). Thanks Alan for this and all your other help! All this means that we now have a total of around 400 men who served in the Great War to research!!!! We have begun, but much remains to do. The names of these men will be added to our own 'Local Roll of Honour' as we research them. All are men linked to Stokesley and District who served in the Great War: some actually fell but are for one reason or another not included in the Book of Remembrance. Some of these men were born in Stokesley, others lived or worked within the Stokesley Poor Law Union. In a few cases cases the men came from elsewhere but enlisted at Stokesley. The fact remains that many of them are ancestors of today's Stokesley folk. These are the men who returned home and helped to make Stokesley what it is today. We would be most grateful for further information about any of these men, or others that we have not so far discovered. All information received will be credited to the providers with our thanks.